So many of our lovely customers start painting in the morning and happily get lost in their art. By the time they’re finished they’re ravenous and need somewhere to grab lunch ASAP. Here’s a quick list of our recommendations for those very moments - all of these suggestions are within a 2 minute walk of us for convenience. Bon appetite! Just two doors up from us on North Rd, this lovely cafe is where we get our delicious cakes from. They do a huge range of fresh lunches. From curries to frittatas to lasagna, there’s bound to be something to tickle your fancy! There’s just something about a well-baked pastry packed full of a delicious assortment of fillings that hits the spot every time. The Cornish Pasty Shop, just round the corner on Gardner St, are a favourite of ours for their Thai vegetable pasty, yum! Another one of Gardner St’s gems! They serve great authentic falafel, as well as other tasty Middle Eastern treats. 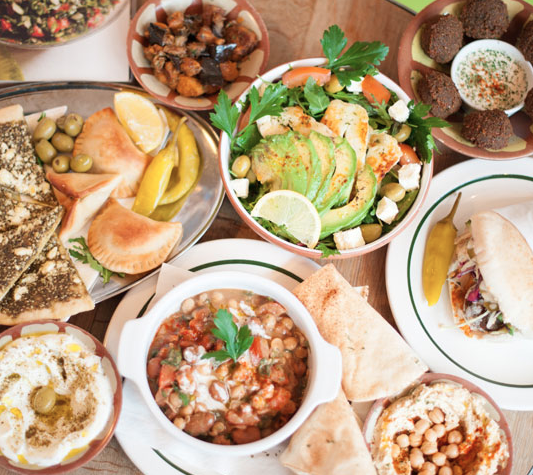 FilFil is worth a visit for their sharing meze, which will fill two of you up for a reasonable price if you have time to sit in. Otherwise, give their falafel wraps a try if you need something for the road. Tucked away in Kensington Gardens, this place is really popular for its fresh fast food. With tons to choose from, they’ll help you stack your plate high with healthy options which are sure to keep you full for hours afterwards. Their menu changes daily depending on seasonal veg, so you’re never sure what you’ll get, but it’s guaranteed to be good! Two words for you: sourdough pizza. These guys know a thing or two about how to combine flavours in a way that makes our tummies rumble just thinking about it! Head to Regent St just 2 mins walk away to get your fill and see what the fuss is all about.